Why do I have it? I enjoyed the first The Girl Who book, and absolutely loved the end, so I definitely wanted to read more. let yours rule the world. Summary: It’s been a year, human time, since September has returned from Fairyland, and she’s started to grow up (at least a little), but when the opportunity comes to return, she leaps at the chance. But once she gets to Fairyland, she realizes that things have gone badly wrong in her absence – and worse, that it might all be her fault. For the shadows of the inhabitants of Fairyland are being sucked into Fairyland Below, and the magic in Fairyland is correspondingly waning, and September suspects that it is the doing of her own shadow, the one that she gave up the first time she was in Fairyland. In order to stop the destruction, September must journey to Fairyland Below, where she meets up with her friends A-through-L and Saturday – or at least with their shadows – and find some way to restore order, even if it means confronting her own shadow to do it. Review: For me, most of The Girl Who Circumnavigated Fairyland…, the first book in the series, was enjoyable if not socks-knockingly so. I like fairy tales, I like modern takes on fairy tales, I like modern takes on fairy tales that use lots of vocabulary and don’t talk down to their readers and where you can feel the narrator grinning at you slyly. 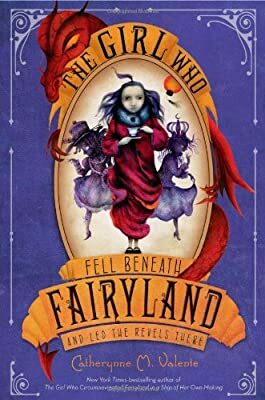 So I liked The Girl Who Circumnavigated Fairyland… and I liked The Girl Who Fell Beneath Fairyland…, but the first book had a phenomenal twist at the end that pushed the whole thing over into “love” territory, whereas this book didn’t quite make it there. I mean, it was good. I enjoyed listening to it. It was episodic, but that comes with the nature of this kind of story. I liked watching September deal with A-through-L’s and Saturday’s shadows, how they’re like her friends but not quite like her friends, but also a part of her friends that was there all along. That was a complex idea that was presented appropriately for the age group but still had quite a lot of depth to untangle. S. J. Tucker does a lovely job with the narration. Her voices were distinct and diverse and well suited to a fairy story: not quite normal but not completely outlandish, either, and her precise diction and overall tone were a perfect fit for Valente’s pseudo-Victorian and slightly smirking prose. I also loved the addition of Aubergine the dodo, and the explication of Questing Physicks was exactly the kind of story deconstruction I like best, about some of my favorite types of stories. But for as much as I enjoyed the individual pieces, I didn’t think they fit together in this book as well as they did in the previous one. There were a lot of elements, which is to be expected, but not all of them were as well developed as they could have been, and the way they came together at the end felt convenient rather than organic. Between the shadows and the Alleyman and Halloween’s plans and the Prince Who Sleeps at the Bottom of the World and the various Physics and the mechanics of Fairyland Below, there was just a whole lot of stuff going on, yet there was never that one piece that made it all click together into something more than the sum of its parts. But tricks like the end of The Girl Who Circumnavigated Fairyland are hard to pull off, and I’m still satisfied with this book as a fun reading experience, even without that extra something. 4 out of 5 stars. Recommendation: There are a lot of elements in this story that depend on a familiarity with the first book, so start at the beginning. But the series as a whole is good fun for kids who like fairy stories, and adults who never grew out of them. Other Reviews: Good Books and Good Wine, The Guilded Earlobe, The Little Red Reviewer and more at the Book Blogs Search Engine. First Line: Once upon a time, a girl named September had a secret.